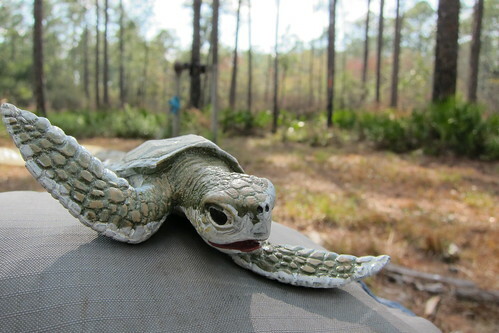 Apalachicola National Forest is a wonderful little place in the panhandle of Florida that has a very unique ecosystem. 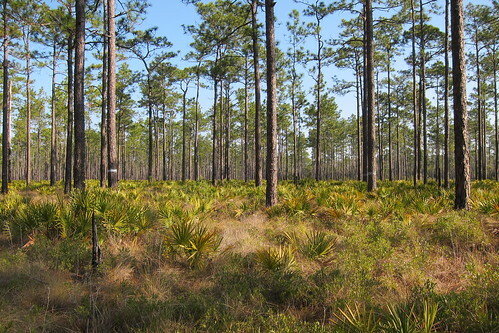 Carnivorous plants can be found and vast ti-ti sloughs stretch across the area. 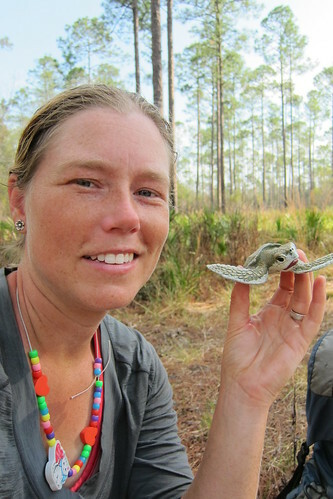 The day had started off drizzly and cloudy at St. Marks NWR but by the time we’d entered ANF it was clear and beautiful. 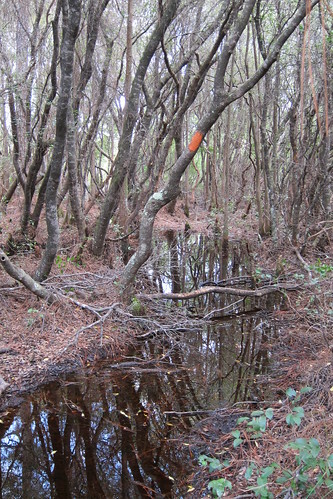 We knew that there was potential for being wet in this entire section, particularly in Bradwell Bay, a well known swamp that the trail goes through. Chris and I had been arguing about doing it or not and during the afternoon we played phone tag with the ANF office trying to find out the water levels. The difference in water from Big Cypress where we did get into some water is that that area does tend to dry up in the winter and that the panhandle and south Florida have very different climates in winter. While that is the dry season in south Florida, winter can be another wet season in the panhandle. 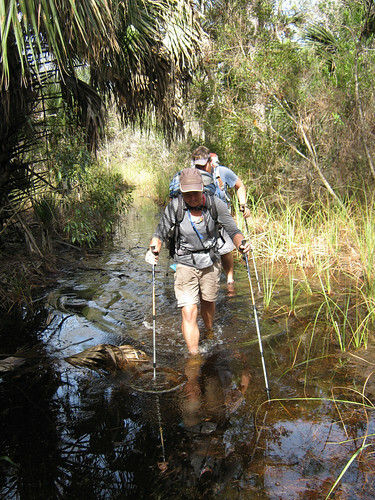 Plus, it didn’t help that the guidebook said that extreme care should be taken in the swamp as it could be ‘as deep as a tall man’s chest’. Hello, a tall man’s chest is over my head! So, when we called the office and they said it was closed we wondered if they meant the whole area or just the wet area. Apparently they’d just burned and finally at the campsite that night the park ranger had left a message informing us to stay out of the entire area. Score for me! Chris had wanted to follow the FT until the blue blaze off the Monkey Creek came up but I didn’t see the reason to bother hiking all of that out of the way instead of following forest roads around to the west side of Bradwell Bay. Speaker had already decided that was what he was doing and the phone call about it being closed sealed the deal that we’d do the same, too. The night before skirting Bradwell Bay we stayed at the Sopchoppy River, near a dirt road and bridge where the river goes by. It was a perfect little campsite and only one or two people drove by that night. 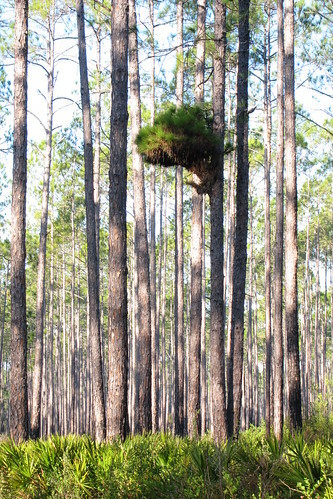 The following morning we did our best to piece together a way to follow the forest roads to get back to the Florida Trail. Part of the legend covered the roads on the map so we had to figure out based on the direction the roads turned. Speaker left before we did and so we followed his arrows in the dirt. Soon enough we’d caught up to him. We saw several pines with these weird growths patterns on them. At the corner of the Bradwell Bay area. We did see along the roads that there were signs posted for future burns, but it sure would be nice if burns were noted at main entrances or more than once along the trail. When we arrived at the other end of Bradwell Bay we saw a sign posted on that end that the area was closed and not far down the trail we saw water. I was glad we’d bypassed that area. I was glad until later on I found out it didn’t matter all that much. 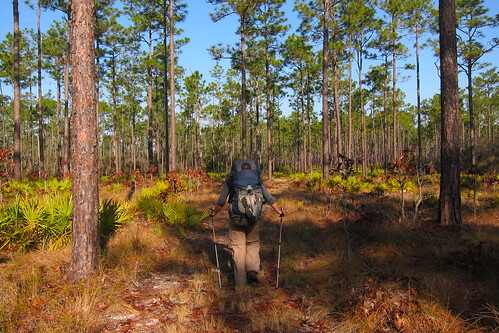 We entered the forest again on the FT and followed rutted out trail from pigs and it was overgrown as well. 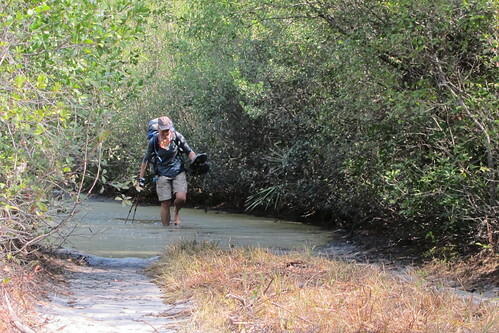 Then we entered a ti-ti slough where we tried to hop from mound to mound or find logs to bounce around on but many times our shoes dipped into the water along the way. We emerged to the other side wishing for bog boards. A forest road with a wide field at the end was our lunch spot for the day and as we dried out in the sun I noticed small objects moving a few hundred yards down the road. We finally decided they were pigs and more than likely piglets. We approached them slowly but finally we got close enough for them to notice we were there and they all quickly dropped down to the ground and eventually scurried off to mom. Nabbed from Speaker’s Flickr photos…We ended up back in the woods again and this time battling water again, finally tying our boots to our packs and opting for our water shoes. The water was quite chilly and numbing to the feet and I wanted to get out as quick as possible. Soon we ended up at Forest Road 329, a paved forest road that was for the most part very quiet. A little less than a mile and back in the woods we followed the trail up and down bluffs before finally paralleling the Ochlocknee River, a very slow moving river. The sky had become ashy from another fire to the west, hazing the sun out of the strong heat we’d been feeling earlier in the day. We’d been hoping to dry our boots out when we arrived at the Porter Lake campground. We reached Porter Lake campground after only about 14 miles for the day, 14 slow miles and we felt pretty exhausted. Certainly not the 20+ we’d been used to and all that water made it worse. Speaker had slowed down and was behind us when we arrived at the Porter Lake campground. I wasn’t sure what I thought to expect when we arrived but we found several trailers and cars at the campground. Great. Chris and I stood near the entrance of the campground when a tall man in his early 70s with big, white beard beckoned for us to come over to the water pump where he was standing. So we walked up to him and and he offered for us to stay at his site with the other folks with him. He’d been familiar with the AT and at first said he’d hiked most of the CDT and PCT but as the evening wore on it seemed more like small sections and bumming around rather than any attempt at thru-hiking or sectioning. It also seemed that he’d bummed around Uncle Johnny’s hostel on the AT for many months, possibly several times over the years. At the campsite was a guy in his 20s and a girl who seemed to be maybe late teens early 20s. The girl had met the older guy online (yes, this is strange) and since he just goes around the country staying at various campsites living simply at various Rainbow People events and other old hippie type things. The girl had dropped out of college and was just working at fast food or something like that and she found this guy and off they went. Definitely kind of strange but they didn’t share tents so maybe it wasn’t anything *too weird*. 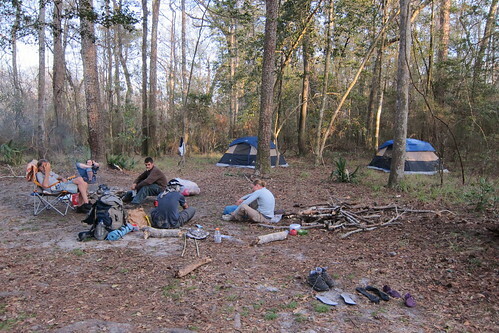 Anyway, they’d gone to the Rainbow gathering in Ocala National Forest and met the other guy in his 20s and he had a car so it was their ticket to move to another area. They’d been at the ANF for several weeks and were planning on staying there for awhile. They had a cooler and would go to town every few days for food or internet at the library and they cooked on the fire. 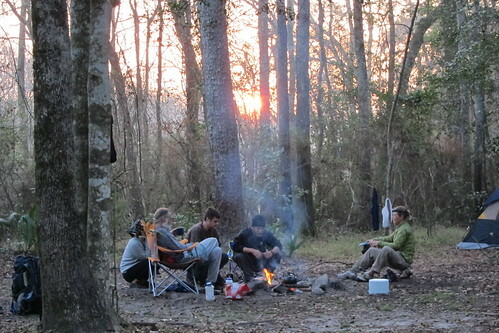 They made cabbage and sausage that night and offered to share with us hungry hikers. They had very good stories to tell, stories of carnies who’d been at Porter Lake and seemed to hiding from the law, abruptly leaving one day and giving some moldy stuffed animals to them, which ended up being burned in the fire that night. The group of three would wash their clothes or hair out of a bucket, the only thing at the campsite was a composting privy and the water pump. The bad thing about the campsite was the plethora of hunters and a group of rude hunters that made noise late in the evening, well after 9pm and well before dawn, turning their generators on to cook food and talking like no one was sleeping. It was quite annoying, especially to be wakened earlier than expected. Speaker stayed behind that morning, lingering over a breakfast of pancakes he’d tried to cook up over the fire. He’d found the batter at the general store in St. Marks and had been debating how to cook them for awhile. 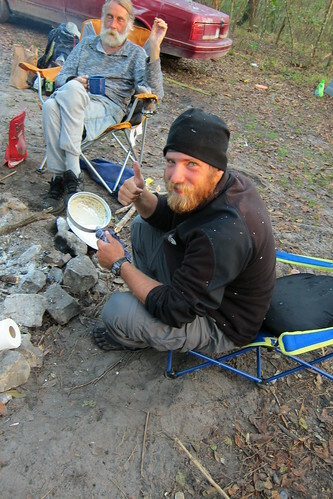 Here he was able to borrow a pan from the three we stayed with (I have the names of these folks written in my journal back at home, they do have names!). Chris and I left to get a jump on the day and see where we would end up. We didn’t know what kind of water we’d be in again. Most of the morning was dry with a few stream crossing. We passed hunters in stands, trying to walk quickly and quietly out of their way. At FR 107 we got confused for awhile finding no turning blazes and no well marked blazes on the road either. The only possible blazes could have been at wooden markers along culverts but the culverts had been recently replaced. Eventually we decided we were on the right road and kept walking westward until finally we saw a blaze. 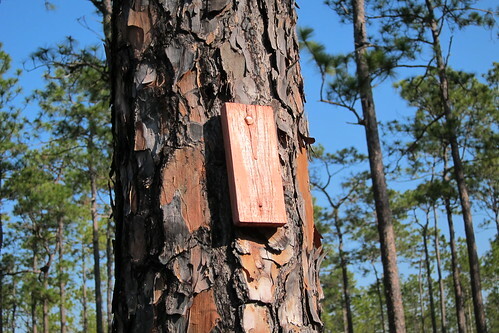 The white bands on the trees are to mark red cockaded woodpecker nesting cavities in pine trees. We didn’t see any of the birds, though. The trail left the forest road and got back into the woods again, this time we spent the afternoon going a few hundred yards between wet ti-ti sloughs. 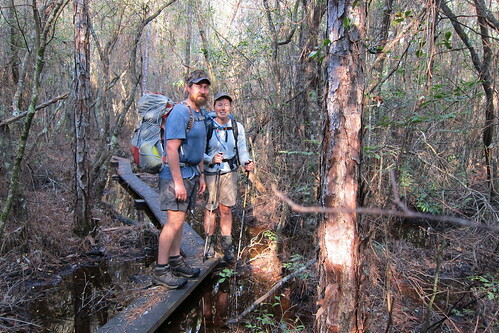 Some of the sloughs had bog boards that were in disarray and the trail had overgrown a few old bridges and new trail had been rerouted instead of fixing the bridges. Eventually I gave up taking my shoes on and off and finally left my water shoes on the rest of the day. Speaker hadn’t caught up to us that evening as we approached Vilas campsite for the night. Vilas is a ghost town and the remnants are seen at the campsite in the form of clay pots from turpentine collection and the bricks from the roads. 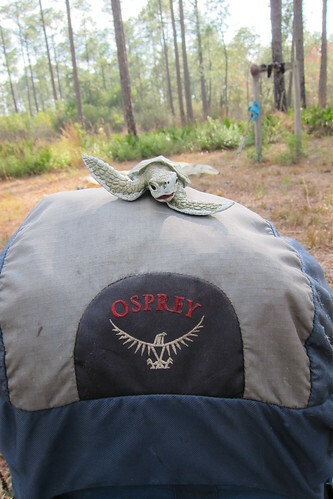 Ridley at the Vilas campsite. Chris went back to the last titi slough to get water for dinner and the next morning and I heard him talking to someone on the way back. Speaker had caught up to us. The campsite was quite nice and quiet, though we found an old jacket that someone had intentionally left at the campsite. The guys decided to burn it and built a small fire pit with the bricks. As the jacket burned out crawled a couple scorpions! Ack! I didn’t like that thought of having scorpions around the campsite. The following morning we crossed SR 65 and found the area directly across the street had been burned the day before and was still smoldering in places. Signs along the road notified work crews of proper turn around areas. 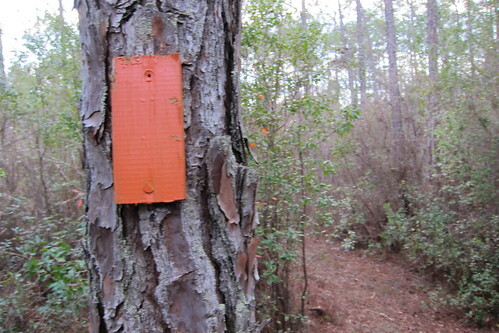 We entered back into the woods and found tape across the entrance but no sign saying we couldn’t go in so off we went. Very inconsistent with how they notify areas of being burned. Most of the area we walked through wasn’t burned and we followed along the edge for the most part. I was a little annoyed at these little weave like jumps the trail would do, just to follow the perimeter of the ti-ti only to get right back on the road it had left. I just looked at the aerial and it is really ridiculous. Later that morning we encountered the longest set of boardwalks through Shuler Bay and we were very thankful for the bog boards—no wading! I just don’t understand the inconsistency in bog boards through the area. Why some areas are more important than others! We’d been planning on booking it to Camel Lake campground for a much needed shower and rest for the afternoon. We arrived just before lunch and spent about three hours showering and lounging. Chris and I had been there a few years prior for a long weekend so we knew what to expect. The campground was very quiet and we only really talked to one person across from where we’d set up for the afternoon. We strung a line across to dry out the clothes we’d rinsed out in the shower. It’d been pushing two weeks at least since we’d left White Springs and our last shower so a rinse no matter how chilly was perfect. I laid out on the ground on the pine needles drifting in and out of sleep, relishing the afternoon. 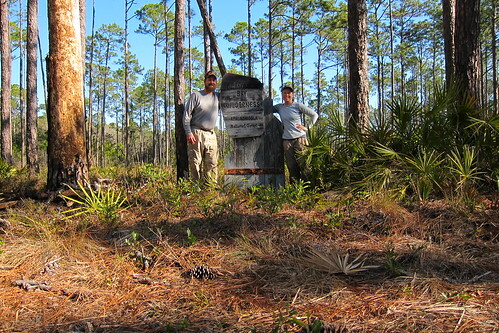 Eventually we decided it was time to move on, following trail that Chris and I had done when we’d camped up here. We’d done a large loop, following the FT and then a blue blaze to the east, reconnecting with the FT to the south. As we’d come up to Camel Lake I’d remembered some of the trail and would try to estimate where we were. I did the same for the north section until it was time to split and take new trail. It stayed dry for a good while until we ended up in titi sloughs again, inching along the edge of the trail trying to skim the water or walking on top of bunching grasses. We found one area that couldn’t be skimmed and off our shoes went. Then we found one slough that had a fresh bridge built over it and we were again astounded as to why bridges weren’t built before. I understand that it is all volunteer efforts and funding for the most part, but geez, this is a known wet area and you’d think some bog boards would be placed. More water kept following when we’d least expect it and we realized we made a good decision to keep hiking as close to the road as possible to camp for the night. If we’d camped further out the next morning we’d of had to wade through. When we got to the road we contemplated trying to hitch up the road to get dinner and Speaker sat by the road for an hour to no avail, finally giving up and setting up camp on the blue blaze trail that leads to the parking area and trail head for this section. Overnight we’d left our fly off the tent like we’d done the previous night but this time the dew from the trees started dripping sometime early in the morning so Chris and I got up to put the fly on. We had a road walk the next morning to get into Bristol and Blountstown, the start of a 40+ mile road walk. We followed CR 12 through rural communities as large trucks and morning commuters whizzed past us. It was foggy but an hour or two later the fog cleared and the sun came out. As we got closer to Bristol we found the store we had planned to hitch to the night before and found it closed. Good thing we didn’t try! It’d been closed for quite awhile, too, as the gas prices were still rather cheap. Once in Bristol we started talking about the food we wanted to eat in town as we made a beeline for the library. The Bristol library was very friendly and easy to use, no i.d. required! After we had our fill of internet we made our way to Apalachee Restaurant, a down home cooking buffet. Mmmmm! We picked a booth in the back hoping to keep our stench away and to avoid weird conversations but someone sat in the booth in front of us an the inevitable questioning happened. Everyone was always friendly about it, despite some of the curious looks. The buffet was great, typical buffet food, but I really liked the cobbler. With full bellies we continued on our way down S.R. 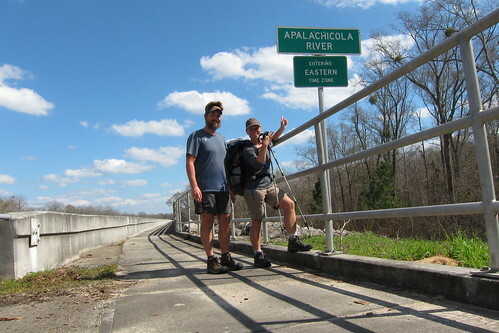 20 where we were looking forward to getting an extra hour in the day as we crossed the Apalachicola River. We said goodbye to the Eastern Time Zone and entered the Central Time Zone! WOOHOO! The river was pretty cool, the bridge across it much longer than expected, and we found some rather large cypress trees that were pushing 500+ years old or more, somehow bypassing the logging days. The Airport Motel, our destination for the night, came closer than expected. We knew it was on the outskirts of town but it seemed a bit further outside of town than we thought. The hotel was mostly deserted and the Indian-American owners were very friendly and when we asked for a ride into town for a resupply they were obliging since they had an errand in town, too. We got showered up and ready for the trip to town for laundry and resupply. At the laundromat the soap dispenser was stuck thus requiring Speaker to bum some soap from a lady doing her laundry. She looked a little strangely at us at first but ended up kindly handing the bottle over. We shopped at the Piggly Wiggly for the first time, just next door to the laundromat and the Chinese restaurant, our dinner of choice. I’d of loved to have walked around Blountstown but the other motel in town was closed and so we had no choice. After a well rested night we got ready for our first 30 mile day! 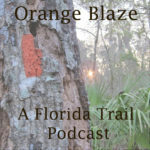 I have been reading “Florida trail Tales” and they had offered to respond to questions on stealth camping and resupply points but I can not find a direct email for them. Would you please put me in direct contact with this couple. 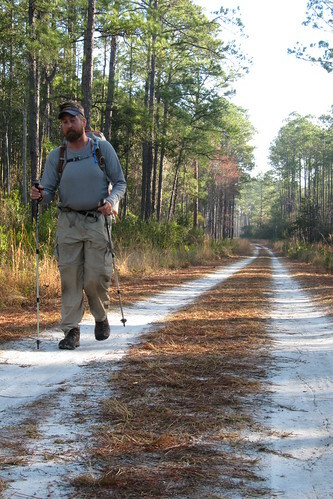 My son “Chili” and I will be leaving Key West in January to thru hike the FT and are in desperate need of contact with other FT thru hikers. of you dishwashing machineand let the burst of water rinse them so powerfully without any traces of mess and oil left.